In so many ways, my wife, Mally, and I can give testimony after wonderful testimony as to how the Lord called us into the creation ministry in Australia—and how He has blessed us all along the way (including the many years we have now spent in America). God’s providence was especially seen during the pioneering days of the late 1970s in Australia, when He provided for our needs time and time again (e.g., friends and family helping us with groceries and other things during the lean first months). It’s been a wonderful 30 years of full-time creation ministry. I hope this brief history will encourage you as you read how God has mightily blessed the proclamation of the creation/gospel message. Ken Ham left a position as a public school science teacher in Queensland, Australia, in 1979 after being engaged in part-time creation speaking for three years (primarily on weekends).1 At a special service at his church, Sunnybank Baptist in Brisbane, the pastor and deacons laid hands on Ken and Mally to set them apart to the work of what Ken was to eventually call the “Creation Science Foundation” (cofounded by John Mackay). 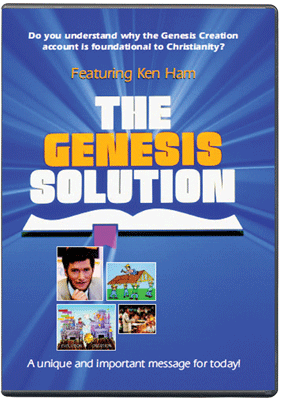 Before the ministry was to change its name to CSF, it was run in two parts: a book ministry called “Creation Science Supplies” and a teaching ministry entitled “Creation Science Educational Media Services.” These two outreaches were based in the home of Ken and Mally (who personally borrowed money to build extensions on their home). When he resigned from his teaching position in 1979, Ken used a small retirement payment to buy the ministry’s first photocopier and electric typewriter. To this day, Ken praises the Lord for Mally and the great sacrifices she made back then (and over the subsequent years); indeed, for the first few years of the ministry in Australia, they had no salary and relied on personal gifts from family members and friends. Even with such a humble beginning, the ministry had a dream—but it was one that took over 25 years to accomplish. 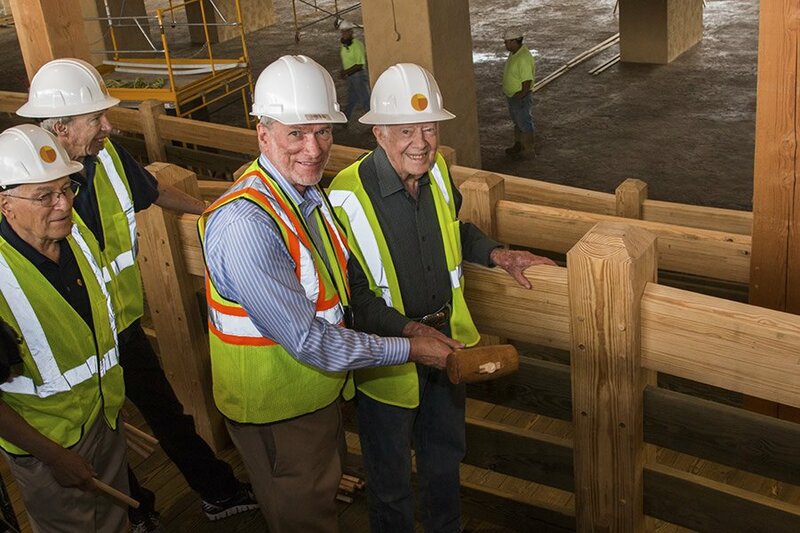 Ken, along with a businessman friend (who would later become a board member), prayed about building a Creation Museum. Just prior, Ken had been in a secular Australian museum, and, standing near an “ape-man” exhibit, overheard a father telling his young son, “This was your ancestor.” Ken said that “My heart ached . . . As a result, my cry to the Lord was: ‘Why can’t we have a creation museum that teaches the truth?’” God answered Ken’s prayer, but it was many years later and on a different continent, America, and in the face of heated opposition, in 2007. The first office (1979) was quite homey. In fact, it was Ken Ham’s Australian home! Two rooms were soon added on as the ministry grew. After establishing the Australian CSF ministry and conducting a few teaching tours in the United States sponsored by Master Books of California (now based in Arkansas), Ken and Mally (and their five children) temporarily moved to Arizona for six months in 1986 to work with Films For Christ. This partnership resulted in about 100 speaking and radio/TV engagements, as well as the production of the well-known The Genesis Solution film (which was nominated as “Best Documentary” by the Christian Film Distributors Association). In 1986, the Australian board of CSF believed that Mally and Ken had a calling from the Lord to move to the United States. Ken was loaned as a speaker to Dr. Henry Morris’s Institute for Creation Research (ICR) in California to help popularize ICR’s creation message around America. Just before the Hams were to move across the Pacific, they were again set apart for a missionary venture (this time to be overseas) at a special service at their home church. Ever since, Ken has called himself a “missionary from Australia to America.” The Hams moved to the United States on January 22, 1987. He remained a director, however, of the CSF ministry in Australia (until 2004). This acclaimed film was shown in thousands of churches throughout America and overseas, and helped promote ICR tremendously. On February 18, 1987, Ken received a phone call informing him of a major leadership problem back home at CSF. It meant either returning home or finding someone else to hold things together and help lead the ministry. CSF scientist Dr. Andrew Snelling (who started and produced the ministry’s Technical Journal in 1984) was appointed as the temporary manager of the ministry, and capably oversaw CSF for a few months; then Dr. Carl Wieland (editor/founder of Creation magazine, which he had handed over to CSF in 1979 after the first two issues) was convinced to join CSF in September 1987 to take over from Dr. Snelling and lead the organization on a permanent basis. While working at ICR in California, Ken was persuaded by CSF’s founding chairman, Professor John Rendle-Short, to travel with him to the United Kingdom. Professor Rendle-Short had a burden for the church in his homeland, and he believed a creation ministry could help equip the church in the UK to defend the Christian faith. After a speaking tour in the UK and seeing the great hunger for the creation/gospel message, Ken was soon burdened for this nation as well. Professor Rendle-Short met a man in England, Mr. Graham Scott, who was very willing to get involved, and a relationship began to build an affiliated creation ministry in the UK. Ken and the other CSF—Australia leaders agreed to produce newsletters, keep a database of names/addresses, and oversee magazine subscriptions for the UK ministry. ICR graciously allowed Ken to go on speaking tours in the UK as part of establishing a CSF mission in the UK. For many years, Ken tried to have ICR and others distribute the CSF magazine in the United States, but for many reasons, this was not possible. Therefore, Ken and Mally began a United States company to distribute the magazine themselves, primarily using volunteers (but eventually having to hire their next-door neighbors and then a full-time secretary). In 1993, after being “on loan” to ICR for seven years and seeing a fruitful ministry in conducting ICR family teaching conferences across America, Ken was broached by Mally with the idea of starting a new creation organization—one that would be more layperson-oriented than ICR (which was, by its name, a much-needed research group and had a graduate school of science, for example). In 1993, Ken and Mally were visited by Wyoming pastor Don Landis and his wife, Beverly. Pastor Landis suggested that it was time for the “loan” to ICR to conclude and to begin a new US ministry. Ken discussed this possibility with various family members in Australia (particularly with his now-late brother Robert) and staff at the CSF headquarters (Dr. Wieland, General Manager Paul Salmon, and others). In late 1993, Ken made the decision to resign from ICR. Two ICR colleagues, Mark Looy and Mike Zovath, also decided to join Ken, and the three founded a new organization that was initially called “Creation Science Ministries,” to be known as “Answers in Genesis” later in the year One of the first donors was Dr. Morris, who also wrote a gracious letter of introduction for the new ministry. Carl Kerby (an air-traffic controller) and Dan Manthei (a businessman), as well as Ken, Mark, and Mike, became the first board members. The assets of the corporation Mally and Ken had set up for CSF’s magazine (including the subscriber list of around 2,000 names, most of whom were obtained by Ken at ICR seminars—ICR was kind enough to allow him to promote the magazine at these venues) were transferred to the new CSM ministry. Next, Master Books graciously loaned its mailing list (over 100,000 names) to CSM for the mailing of an introductory brochure (which also requested start-up donations) to be sent throughout the country. Meanwhile, a Michigan family helped “kick-start” CSM with a significant five-figure donation, and CSF–Australia offered to be a “safety net” to loan CSM funds if it was needed (but that was never necessary and thus no CSF money was borrowed). The US ministry was started as autonomous (but with a “sisterly” relationship with the Australian organization) and stood on its own two feet financially from the very beginning. 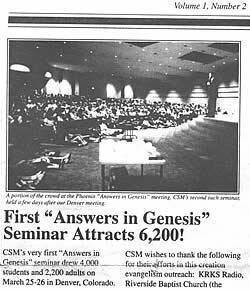 Through a number of well-attended seminars called “Answers in Genesis” in cities like Denver and Phoenix, and the growing faithful support from donors, the US ministry was launched in good financial shape in early 1994 (and, praise God, has maintained a sound financial footing). Other godly men (including Pastor Landis) were approached about being on the US board and thus be the authority to which all staff (including CEO Ken Ham) would be accountable. Ken Ham, cofounder of the Australian ministry, remained on the Australian CSF board. To maintain a close association, some board members of the Australian ministry continued to be appointed to the US board, and some US board members continued to be appointed to the Australian ministry. In addition, the American ministry aided the Australian group with annual (sometimes more) speaking tours called “Down Under Tours,” and CSF–Australia would occasionally send its speakers to the United States. In March 1994, Ken’s family moved from southern California to northern Kentucky to start up the new headquarters, and Mark’s and Mike’s families followed. They established operation in rented offices in Florence, Kentucky (about 14 miles south of downtown Cincinnati, Ohio, not far from I-75). The Cincinnati-area location was chosen because almost two-thirds of America’s population live within 650 miles, and since a future Creation Museum was planned, this strategic location was very important in determining where to be situated. The second newsletter from the new ministry highlighted some exciting news. 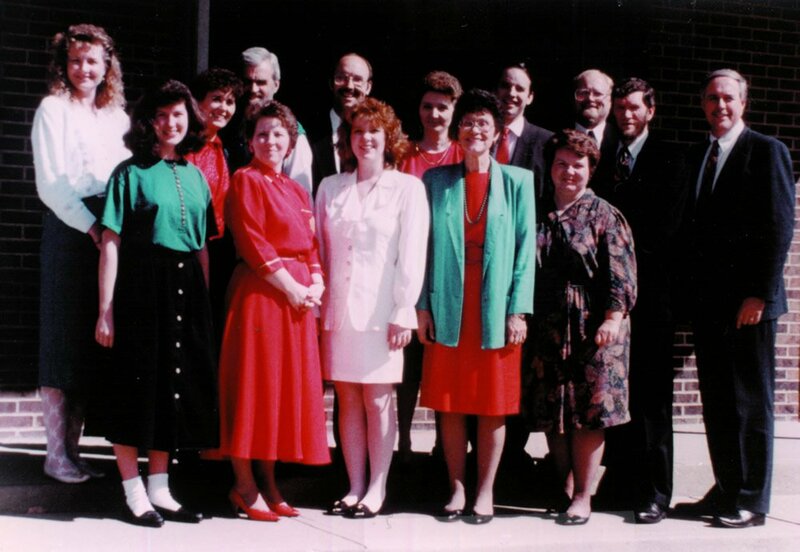 AiG’s first major conference was held in March 1994 in Denver, Colorado, where 2,200 adults and over 4,000 students attended. The first ministry newsletter was mailed out in March as well. The Answers . . . with Ken Ham radio program began airing on 45 stations in October of 1994. Indeed, AiG’s first year was marvelously blessed by God. In fact, by early December 1994, over 85,500 people had been reached at teaching events, and 142 radio stations were carrying the new radio feature. Late that same year, a meeting was held with the new AiG Board in Wyoming. It was at that meeting the board decided to change the organization’s name to “Answers in Genesis,” to reflect the fact that the ministry was not just about “creation,” but the authority of all of Scripture—as well as about evangelism and equipping believers to build a biblical worldview. Sometime later, CSF–Australia followed the United States’ lead and changed its name to AiG–Australia. Ken Ham (along with colleague Mike Zovath) continued their travels to the UK each year to conduct teaching meetings, working closely with Mr. Scott there. Eventually, as Mr. Scott was considering retiring, Dr. Monty White of the University of Cardiff (Wales) was asked by Ken and Mike to lead the UK ministry. The US board agreed to act as a safety net for this new phase of growth in case the UK ministry needed help. In 1995, board member Carl Kerby designed and launched the AiG website. Soon, the sister groups in the UK and Australia wanted to have home pages on the US-managed website, so the US site became the website for all sister ministries. AiG–US hired the necessary staff to oversee all aspects of the website, including maintaining the home pages of the other AiG ministries (at no cost, even though the expense was growing substantially each year). AiG–Australia provided web articles from Creation magazine, as well as “feedback” articles written by its staff and articles on “hot” topics (these constituted almost half the site’s content by 2006). In turn, AiG–Australia used articles from the newsletters and other writings of the US ministry, as well as thousands of resource descriptions and video/audio streams created by the US ministry. The fledgling new AiG ministry had its first office in a tiny strip-mall office in Florence, Kentucky, just south of Cincinnati. In the mid-1990s, AiG was searching for land in northern Kentucky upon which to build a Creation Museum and new headquarters for its rapidly growing speaking ministry, radio program, and web outreach. The ministry was constantly in the local news due to strident opposition from evolutionists/secular humanists and others against the two land rezoning efforts. The controversy soon made national and even international headlines (e.g., The Times of London). Opposition to the museum project had one local newspaper reader (who did not know AiG very well) so concerned about the way AiG was being attacked that his family gave a $1 million museum gift. 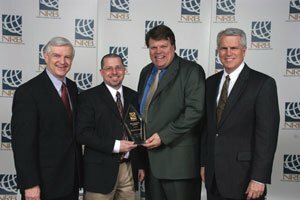 Rod Martin, then–AiG director of Internet outreach (center left) and Dale Mason, AiG vice president of marketing (center right) receive the “Best Ministry Website” award from NRB’s Dr. Ron Harris (chairman) and Dr. Frank Wright (president) at a special ceremony in Dallas, Texas (February 2006). During this decade, AiG–US saw hundreds of new radio stations carrying the Answers radio program, a huge boost in visits to the AiG website (now averaging about 30 million visits a year), and several hundred requests each year to conduct teaching meetings. In 2006, the AnswersInGenesis.org website received the prestigious “Best Ministry Website” award from the National Religious Broadcasters, a group of 1,300 ministries (including most of the large Christian groups in America). In the previous year, Answers was nominated as NRB’s best radio teaching program. By 2004, AiG had grown to nearly 100 staff working out of four rented offices in northern Kentucky. In September, the entire staff was thankful to move into one building (next to the Creation Museum under construction), on 50 beautiful acres along I-275, just west of the Cincinnati Airport in a building that AiG now owned. As staff moved into their new headquarters facility, the multi-columned Creation Museum was being built next door in preparation for a spring 2007 opening. At the same time, differences in philosophy and operation were becoming more apparent between the US ministry and AiG–Australia, which were two separate, autonomous organizations with separate boards—yet had a common statement of faith. For example, the US ministry had a decentralized leadership structure (i.e., where a “leadership team” runs the ministry’s day-to-day operation, with general oversight by the president, Ken Ham). This was a different approach than that employed by the Australian organization. As differences involving organizational and philosophical issues grew, the two boards met on many occasions to try to deal with these matters. Meanwhile, the Australian board met with its own CEO and senior staff numerous times about these differences. Eventually, it was realized that the issues between the two leadership teams could not be resolved, and so it was mutually decided by both boards in 2005 that AiG–US and AiG–Australia (now called CMI) had to separate totally and move on to have a formal, business relationship, yet to work cooperatively on joint projects. In October 2005, the Australian board cordially met with the US board in northern Kentucky to work out the formal arrangements. It should be noted that differences between ministries were not over doctrinal issues (or even any scientific controversy regarding the book of Genesis). It stemmed not only from a difference of how ministry activities would be conducted, but also (among other things) where both ministries believed the Lord was leading them. For its part AiG–US, for example, had just devoted two years to prayerfully and carefully develop a 10-year strategic plan to help it become even more effective in proclaiming the creation/gospel message throughout the world. AiG–US realized that its particular strategies were not embraced by CMI/AiG–Australia, and that differences of ministry philosophy were likely only to widen. The teaching ministry continued its dramatic growth. In 2006, over 300 events in various cities were held. A single visit to one city might see up to six different speaking opportunities at an “event”—in front of six different audiences. AiG’s exceptional speakers included many with earned doctorates in a variety of fields, including one with a PhD in biology from an Ivy League school (read their bios and qualifications, and perhaps consider scheduling one or more of them for your church or group). Also, several dozen Video Conference Volunteers were trained in the last half of the decade who began hosting AiG video seminars in small and large towns across America. The inaugural issue of a new apologetics magazine. The award-winning AiG website was shown on some rankings to be visited by nearly as many people as Focus on the Family and other leading ministries. In other media, the Answers radio program was being carried by about 800 US stations and hundreds more overseas, and AiG spokespersons were regularly appearing in the secular and Christian media (e.g., CBS Evening News, NBC Nightly News, The PBS News Hour with Jim Lehrer, Nightline, CNN, BBC, Times of London, etc. ), a trend that escalated as the museum’s opening drew nearer. Another major development in the ministry was occurring in 2006. The US organization had expressed a concern about the renewal rate for subscribers to Creation magazine (more than 50% did not renew after one year). AiG–US therefore conducted a statistically valid, scientific survey of its subscribers. The results indicated that a new magazine was needed, one that would emphasize the biblical worldview, would have widespread practical application, and would feature biblical and scientific articles on the origins issue. Several large rooms (some 48-feet high), animatronic dinosaurs, a planetarium, and more than 50 video displays present Creation Museum visitors with a “walk through biblical history”—with a heavy evangelistic emphasis. While the intent was to offer both the Australian-published magazine and the new US-published Answers magazine sometime in 2008 or 2009 as two options for its subscribers, irreconcilable differences arose concerning the printing and distribution of Creation magazine in the United States. AiG–US as a result had to modify its strategic plan to offer just the new Answers magazine, rolling it out two–three years ahead of schedule. While this regretfully meant that Creation would no longer be distributed through AiG–US, the prospect of continuing subscriptions through the provision of a brand-new, culturally relevant, apologetics-based periodical (with an enhanced worldview emphasis) was exciting. AiG–US was also very encouraged to learn of the buzz that was generated about the new magazine as expressed by overwhelmingly positive feedback from its subscribers. With the launch of a new magazine and the opening of the Creation Museum before the summer of 2007, AiG–US was looking forward to additional new opportunities, while remaining committed to the same strong authoritative biblical teaching and scientific credibility the ministry has always maintained. Meanwhile, the eight-person leadership team of AiG–US (including the CEO/president) received the full, unqualified support of the US Board of Directors, and had been complimented by the board for the vision, leadership, and performance of the fast-growing ministry. 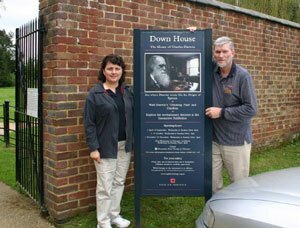 On a 2006 speaking tour of England, Ken Ham (and his wife Mally) visited Charles Darwin’s home. It was at this location that Darwin composed On the Origin of Species (1859). The book’s anti-biblical message radiated out to the world from here, leaving destructive consequences in its wake. In January, AiG launched a new division that would expand the ministry’s international outreach: Answers Worldwide. Soon, this division was setting up apologetics training courses for Christian leaders who travelled to AiG from around the world, conducting speaking tours overseas, and increasing the number of translated materials and articles to 75-plus languages. 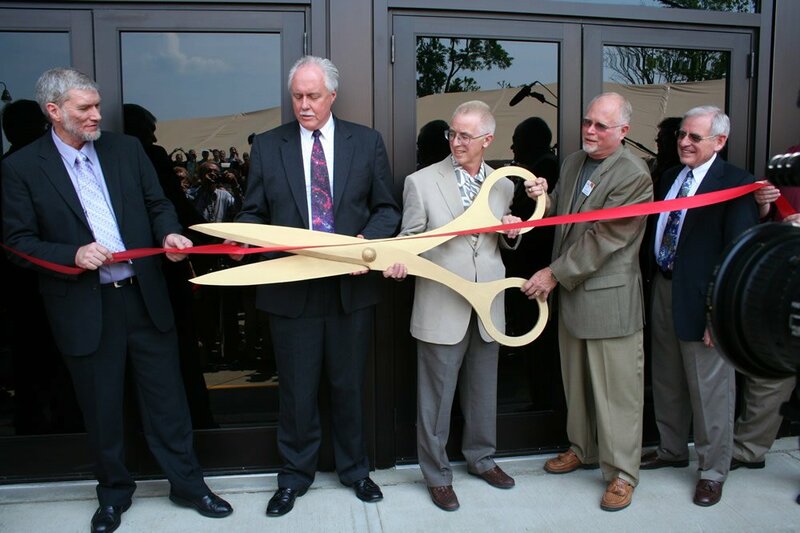 Undoubtedly the highlight of the ministry’s relatively young life was the opening of the Creation Museum on May 28, 2007 attracting over 4,000 people (and about 60 protestors). On May 26, a private ribbon-cutting ceremony had been held; over 100 credentialed media attended either that day or at the public opening two days later. During this time, Ken Ham was interviewed on FOX–TV’s The O’Reilly Factor and FOX and Friends in the Morning, CNN’s Situation Room with Wolf Blitzer, ABC-TV’s Good Morning America (which did a live broadcast remote at the museum), and several dozen other outlets. In addition to the many British and Australian correspondents who came to the museum in its opening weeks, multiple media representatives from countries like Switzerland and Japan toured the museum and filed stories. Major stories eventually appeared in all of America’s leading newspapers, each of them highlighting the high-tech nature of the center, from its state-of-the-art planetarium, to its SFX Theater and first-rate animatronics. A May 26, 2007 ribbon-cutting ceremony was attended by AiG staff and supporters, plus the world’s media. Left-right: Ken Ham, Mark Looy, Patrick Marsh, Mike Zovath, and Don Landis. Another highlight of 2007 was the amount of traffic to AiG’s website. On one day alone in 2007, 94,000 visitors and 343,000 page views were recorded in a 24-hour period—a phenomenal figure for any ministry. 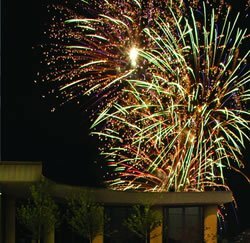 The one-year anniversary of the Creation Museum was celebrated with a dazzling fireworks show on May 23, 2008. Just two days before, the museum attracted its 400,000th visitor. With many Saturdays in 2007 seeing guests numbering 3,000–4,000, the museum had its 250,000 visitor come through in early November, almost seven months ahead of projection. In May 2008, a petting zoo opened across the lake from the museum, plus new restrooms and two cafes were added to accommodate some large crowds (usually on Saturdays), and additional parking spots were being planned. Extended opening hours for Friday and Saturday were also instituted. By the end of 2008, God had blessed AiG–US with about 260 staff (growing to over 325 in the summertime because of large museum crowds)—and several animals (on display in a new petting zoo, which was to become a great family attraction on the museum grounds). The Answers radio program was now heard on about 900 stations worldwide, and the AiG website continued to be one of the most-visited religious websites in the world. Answers magazine had exploded in growth with over 75,000 subscribers. Wonder why so many young adults have left the church of their youth? 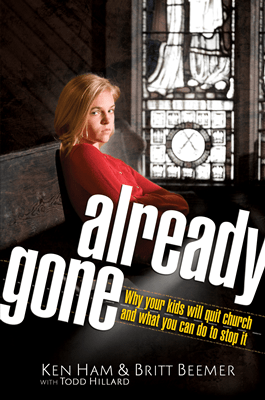 Already Gone reveals the startling reasons—yet offers the much-needed remedies. 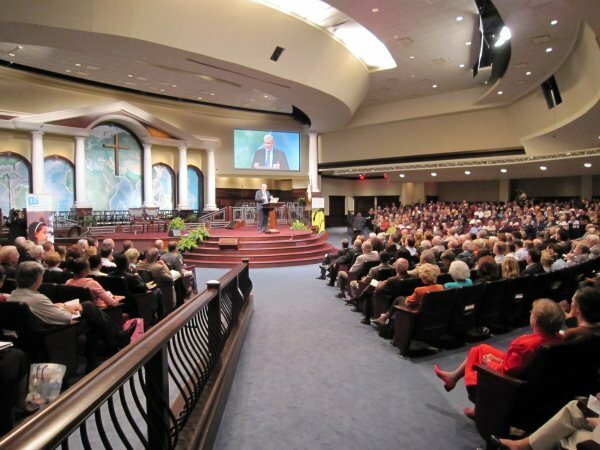 In 2009, Ken spoke at the First Baptist Church of Atlanta at Pastor Charles Stanley’s invitation (October 2009). At the end of the museum’s second year of operation (May 27, 2009), 719,206 guests had toured. That same week, a groundbreaking new book coauthored by Ken Ham, Already Gone—which startlingly documented that the exodus of 80% of young adults from the church had already occurred in their minds well before college, and largely because of their doubts about the Bible—was released. Already Gone revealed why so many young people are leaving the church (e.g., among many things: most Sunday school programs are not helping children and teens, and they see that the Christian faith is not relevant or defensible, and that even Sunday school can be detrimental in trusting the Bible). The book also presented solutions to help stem this huge church exodus. The release of Already Gone led to several dozen media interviews through the summer, and an invitation for Ken Ham to speak at the morning worship services at the well-known First Baptist Church Atlanta (Charles Stanley, pastor). At the end of 2009, 931,696 people had toured the Creation Museum since it opened over 2½ years before. 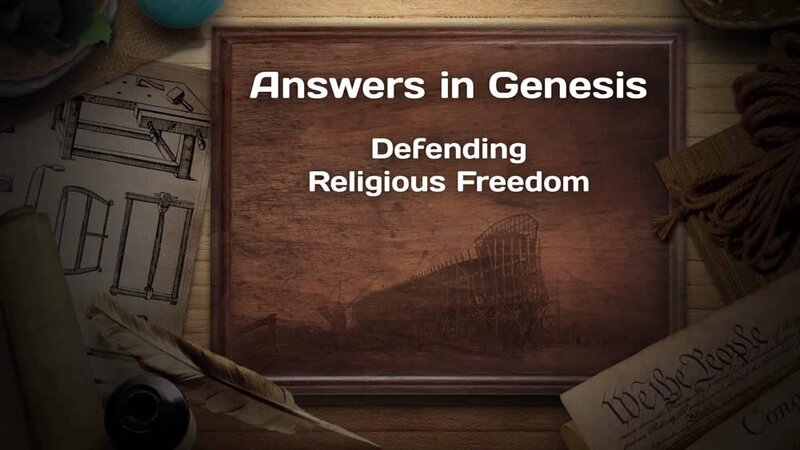 The national media also covered Answers in Genesis in the summer of 2009 regarding a raucous visit by 285 atheists/agnostics to the museum, led by a vehement anti-creationist and atheist professor from Minnesota. Some poor reporting (e.g., the ABC News website) claimed that our museum teaches that “the beaks of Darwin’s finches are explained by God’s will, not evolution; and mankind spread from continent to continent by walking across the floating trunks of trees knocked down during the Biblical Flood.” This writer toured the museum, and we wondered how he ever came up with those bizarre claims. The atheist professor wrote an item that was even worse in its reporting. In a blog column with a headline wrongly blaring that a young student in his group was “Expelled from the Creation Museum,” the professor was not exhibiting careful research; see our report on that very unusual day at this blog post. One area of increasing ministry opportunity has been in international outreach. 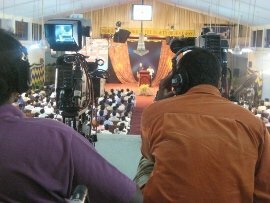 In the summer of 2008, a video crew taped AiG talks in India (above), to be translated into Hindi and Telugu. In 2009, talks were taped in Japan and these translated lectures were in post-production through the rest of the year. Towards the end of 2011, translators representing 77 languages had engaged in producing AiG materials. 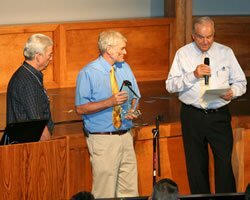 AiG and its president, Ken Ham (center), were presented with the 2008 “Integrity Award” by the National Association of Christian Financial Consultants (NACFC, a group of 300 investment professionals committed to financial planning centered upon biblical principles). It was yet another testament to the strong oversight of AiG’s board in ensuring that the ministry is committed to integrity in all areas, including finances. Left: Mike McCormick, president of the NACFC; right: Wes Pennington, NACFC’s executive director. Two positive media developments occurred in the spring of 2010. A TV ad promoting AiG’s “I Am Not Ashamed” ( 2 Corinthians 2:15 ; Romans 1:16 ) campaign was aired nationwide on the popular CBS TV newsmagazine 60 Minutes, and it also played several times on the Fox News Channel. (Watch the TV spot here.) Billboards and print ads for “I Am Not Ashamed” also appeared nationally (e.g., the USA Today newspaper). On April 26, national media covered the arrival of the museum’s one-millionth guest (in less than three years). In its third year of operation, which concluded May 27, the museum drew over 300,000 visitors, which, given the rocky economy, was a major blessing. The next day, several child-friendly interactive exhibits collectively called the Kneehigh Museum opened within the existing Creation Museum. Kentucky Governor Steve Beshear (left) made the Ark announcement at a press conference inside the state Capitol on December 1. At the microphone is Mike Zovath of AiG, who made follow-up comments. Because God blessed the Creation Museum with over one million guests in its first three years of operation, the AiG board decided that the time was right, even in a challenging economy, to construct a full-scale Noah’s Ark (built out of wood) and historic biblical-era village. Called the Ark Encounter, this project promised to become yet another effective outreach to show guests that the Bible is true. 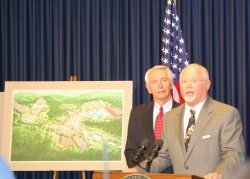 On December 1, 2010, Kentucky Governor Steve Beshear joined AiG’s leadership—and a representative from AiG’s partner in the project, the Ark Encounter LLC of Springfield, Missouri—to announce the planned construction of this major new tourist attraction in the state. With God’s blessing, the Ark Encounter was projected to open in the summer of 2016 on about 800 acres off I-75 in Grant County, Kentucky (about 45 minutes from the Creation Museum) and south of Cincinnati, Ohio. 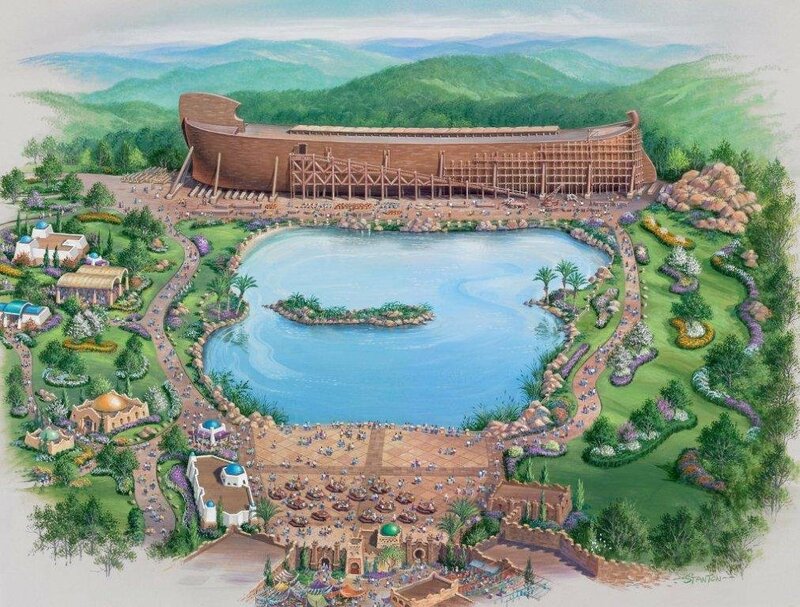 A feasibility study conducted by the renowned America’s Research Group indicated that the Ark may attract more than one million visitors the first year. 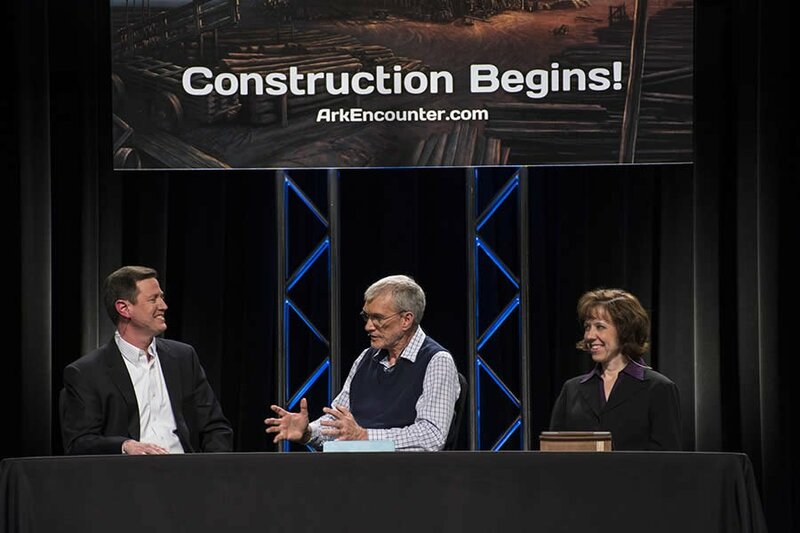 As the press conference was being held, AiG launched a new website, ArkEncounter.com, where a brief video and articles related to the Ark project were posted. Over the next few days, much of the world’s major media covered the Ark Encounter announcement. They ranged from ABC-TV’s World News Tonight with Diane Sawyer and the New York Times in America, to several prominent newspapers around the world—and even the famed British newsweekly, The Economist. At the same time, much of December 2010 was devoted to correcting many “misrepresentations made in the media” about the Ark Encounter. This artist’s representation of Ark Encounter features the full-size replica of Noah’s Ark. With only five years under its belt, AiG’s Answers magazine was the recipient of the “Award of Excellence” by the Evangelical Press Association (EPA). Answers was recognized as #1 overall in the esteemed “General” category. 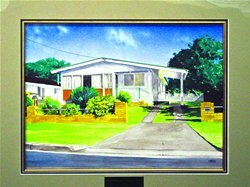 It was also commended in other categories related to the quality of writing and artwork. By the end of 2011, one of the three revenue-raising sources for the Ark Encounter’s total funding, donations for the Ark structure itself, was nearing $5 million (quite encouraging since fundraising had only started 12 months prior and during a tough US economy).3 Also, at the conclusion of 2011, one of our ChristmasTown visitors became the 1.5 millionth guest at the Creation Museum since opening in 2007. The Creation Museum’s first outdoor Live Nativity, with related Christmas activities and thousands of lights, launched in December 2008. 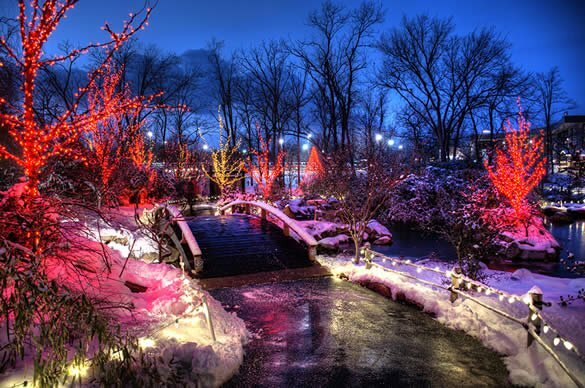 Within a few years, up to 5,000 people a night were attending these special Christmas events that are now called “ChristmasTown.” The activities include a unique planetarium program (on the star of Bethlehem), a large nativity scene, tens of thousands of colorful lights and decorations, dramas, musicals, and more. In 2011, a shocking book on the state of Christian colleges and universities written by Ken Ham and Dr. Greg Hall (with renowned researcher Britt Beemer) was released. Already Compromised exposed what professors and college presidents are actually believing and teaching regarding the Bible and science. It was a much-needed exposé on the spiritual health of Christian colleges and those leading them. The 2011 AiG Conference in Malaysia was not only a huge blessing because of the large crowd that turned out from 20 nations, but also because of the remarkable enthusiasm of the 1,000 attendees from Asia and other parts of the world. In preparation for the Ark Encounter’s opening later in the decade, AiG began a master plan for the enlargement of the Creation Museum site, in anticipation of a dramatic increase in museum attendance once the Ark welcomes its visitors. Accordingly, a 1,000-seat multi-purpose auditorium, called Legacy Hall, opened in August next to the museum. 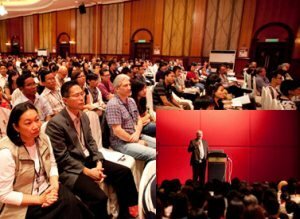 In November, in what may have been the first of its kind, about 1,000 Christian leaders from all over Asia and other countries heard AiG’s Dr. David Crandall and Ken Ham speak at the “All-Asian Creation Conference” in Malaysia. Co-sponsored by AiG, the conference’s ripple effects were soon felt in the 20 countries that were represented. Enthusiastic attendees brought back dozens of full boxes of AiG resources to their homelands. The year started with great news. For the second time in six years, AiG was blessed to be the recipient of the “Best Ministry Website” award from the 1,200-member National Religious Broadcasters. Each year NRB acknowledges a ministry website that “shows excellence in design and content, is creative in presentation, and is helping fulfill the ministry’s mission.” As the year starts, AiG is receiving about one million web visitors every month. And for the second year in a row, Answers magazine won the EPA’s top award for general excellence among Christian magazines. In April, the Johnson Observatory opened on the Creation Museum grounds. Two 16-inch reflector telescopes, one of them the historic Johnsonian telescope, are now enhancing the museum experience for our guests who attend various astronomy programs on select evenings. The historic Johnsonian telescope is now in use at the Creation Museum. 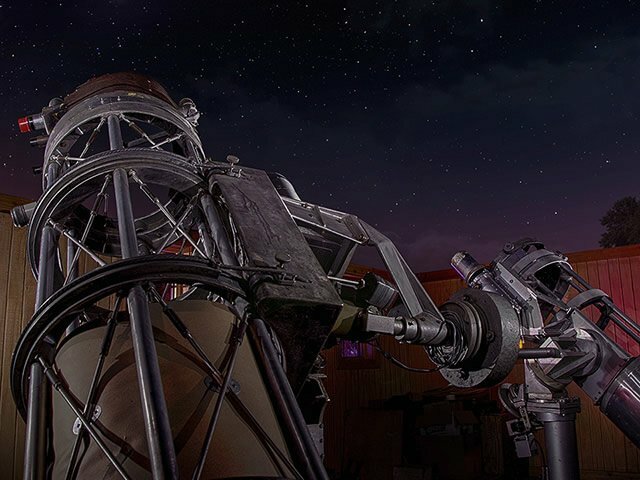 The Creation Museum’s high-tech Stargazer’s Planetarium had already drawn more than one million visitors in less than five years. Now with the Johnson Observatory, our visitors can experience another major museum attraction on the topic of astronomy and the Bible. They will leave with a better understanding of the Bible’s declaration that the heavens declare God’s glory ( Psalm 19:1 ). As a part of the Creation Museum’s fifth anniversary in May, a stunning holographic exhibit to debunk the so-called ape-woman “Lucy” was unveiled, and it quickly drew the ire of many evolutionists who often use this partial skeleton as their best example of an ape-like ancestor of humans. Soon after, our nationwide billboard campaign, using dinosaurs to promote the museum, was also met with howls of protest. Evolutionists often consider dinosaurs to be the icon of their belief system. They also accused the museum of using dinosaurs to lure young people into the museum. Less controversial yet with the prospect of having a major national impact was the summer release of the ambitious ABC Sunday School, a Sunday school program that takes seven age groups on a three-year tour of the Bible’s 66 books. By 2017, over 10,000 churches were to use the curriculum. Following up AiG’s wonderful 2010 outreach at the Winter Olympic Games in Canada (drawing over 100 AiG volunteer evangelists to Vancouver), AiG assembled another team of 100 volunteers to share their faith and pass out thousands of witnessing booklets in several languages during the 2012 Olympic Games in London. In November, donations and memberships for the Ark Encounter crossed the $10 million mark to build a $24.5 million full-size Noah’s Ark, part of the $100 million themed attraction. At the end of the year, AiG announced its ministry theme for 2013–14: “Standing Our Ground, Rescuing Our Kids” ( Galatians 1:4 ). This effort included a series of initiatives designed to counter the efforts of secularists who are increasingly attempting to capture the minds of children and teens for secular humanism. 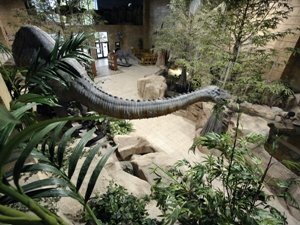 On the sixth anniversary of the Creation Museum, three striking new exhibits opened on Memorial Day as a part of the popular museum’s ongoing expansion. A large and spectacular “Dragon Legends” exhibit answered the question (among many others): “Were dinosaurs dragons?” Also, the museum opened a high-tech insect display with the curious name “Dr. Crawley’s Insectorium.” Donated to the museum by a collector with the real last name Crawley, the rare insect collection rivals the quality of the Smithsonian’s display. Some of the insects are quite large and strikingly colorful. Lastly, there was the placement of over twenty rare Bibles and Bible-related artifacts as part of the famed Green Collection’s Verbum Domini selection of valuable items that the museum was privileged to display. Three weeks after these stunning exhibits opened, the largest zip line course in the Midwest (23 lines and 10 sky bridges, covering almost 2½ miles) opened on the museum’s beautiful forested property. “Dr. Crawley’s Insectorium” features one of the finest insect collections in America and is presented in a high-tech way—including the use of an animatronic “Dr. Arthur Podd” seen here. In the fall, AiG shared with its supporters that it would continue its ministry theme “Standing Our Ground, Rescuing Our Kids” through the next year, and accordingly also announced that in 2014 the Creation Museum would offer free admission for children under 12, as long as they are accompanied by at least one paying adult. Also in the fall, well-attended AiG seminars were conducted in Bolivia, Peru, and Mexico. By December, the Ark Encounter had seen a huge swell in funding through various channels, and at the end of the year, donations and memberships were pouring in through the mail and via the AiG website. On February 4, a momentous event in the history of the creation/evolution question took place at the Creation Museum. 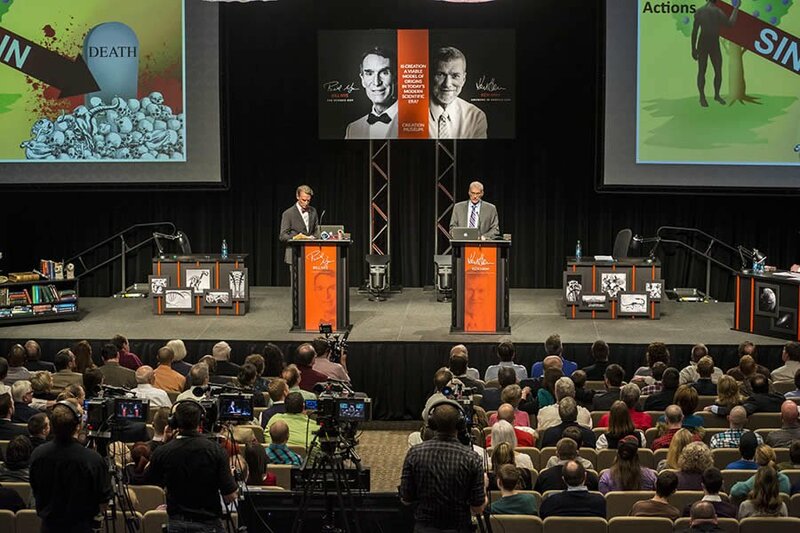 A minimum of seven million viewers watched an online live stream debate between Bill Nye “the Science Guy” of TV fame and AiG’s Ken Ham. In what some observers dubbed “Scopes II,” Nye and Ham held a passionate but cordial 2½ hour debate that caught the attention of the nation. Facebook reported that the debate was the number one trending topic for many hours before the event even began, and for a time, the event was half of Twitter’s trending topics. At the debate, 70 media representatives heard Ham stress how the definition of the word science is often misrepresented, particularly in the differences between observational and historical science as it relates to origins. One of the high points occurred when Ham refuted Nye’s previous claim that a scientist who is a creationist is a bad scientist as Ham showed a clip of creationist Dr. Raymond Damadian, inventor of the MRI scanner. Another highlight happened when, after hearing Mr. Nye say more than once that he did not have an answer to a question, Ken replied, “Well, there is a Book . . .” referring to the Bible and the answers it can present to challenging questions. The off-the-cuff phrase “there is a Book” was picked up by countless media outlets and bloggers, and also showed up on a T-shirt. Along with those who watched the recorded debate later, a minimum of 25 million people from 210 countries and territories were to view the debate. A summary of the event can be watched at the ABC Nightline video archive. 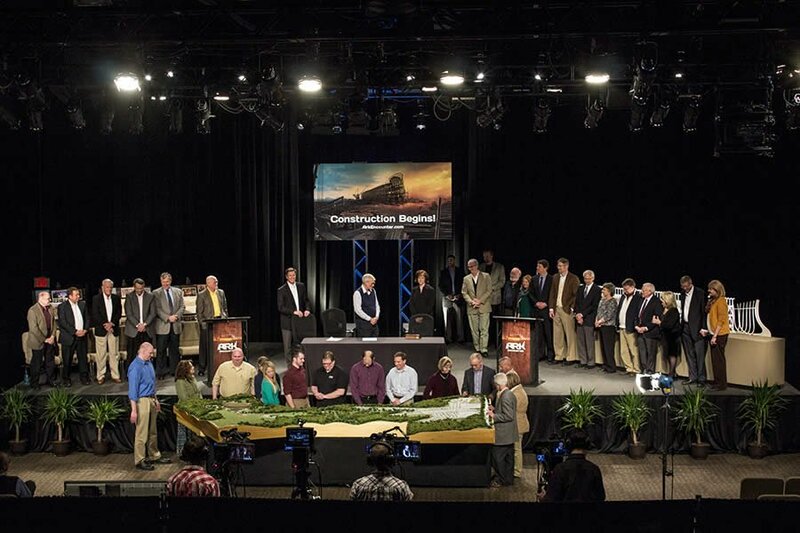 The most memorable month of AiG’s 20-year history ended with an historic online press conference on February 27, as Ken Ham, Joe Boone (VP of Advancement), and Dr. Georgia Purdom (AiG researcher) announced that enough money had been successfully raised to close the bond offering for the Ark Encounter, and that most of the funding was in place to start construction of phase one of the Ark project in Williamstown, Kentucky. Recent global media coverage of the Ark Encounter, as well as the Hollywood blockbuster film Noah and Ham’s well-publicized February 4 debate with Bill Nye “the Science Guy,” all helped bring the Ark Encounter to the world’s attention in February. The date of the debate with Bill Nye had been on the AiG calendar months before it was known what the final delivery date of the Ark bonds would be. Ham remarked, “In God’s timing, not ours—and although the bond registration had already closed before the February 4 debate and thus no more bonds could be purchased—the high-profile debate prompted some people who had registered for the bonds to make sure they followed through with submitting their necessary, and sometimes complicated, paperwork.” In the end, the debate helped motivate some registrants to make sure they submitted their needed paperwork to complete their bond purchase. “Construction Begins” is what the sign declared during the February 27 live stream event attended by AiG staff and dignitaries. 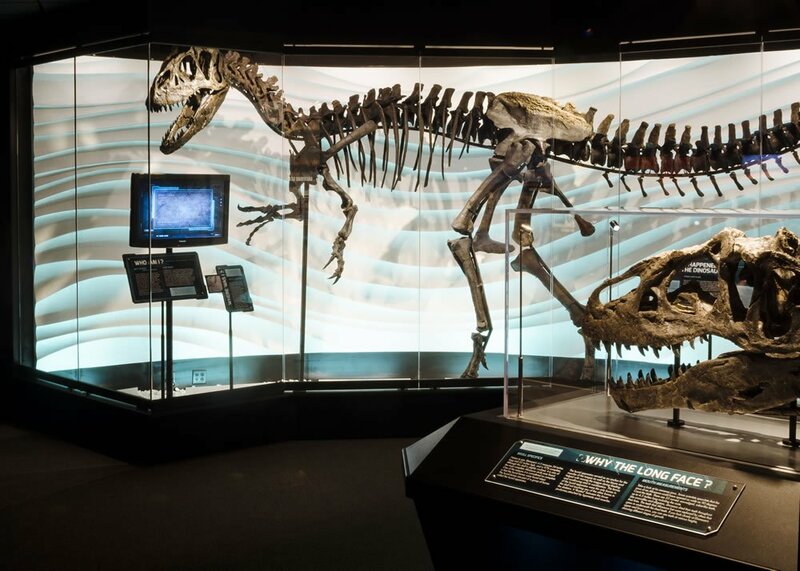 On May 23, just as the Creation Museum was about to complete its seventh year of operation, a world-class dinosaur, appraised at $1 million, went on display to challenge evolutionary thinking. An allosaur skeleton—having one of the best-preserved allosaur skulls ever discovered—joined an already-impressive array of dinosaur exhibits in the museum. At 30-feet long and 10-feet high, the allosaur, named Ebenezer, is exceptional for its almost-complete, three-foot-long skull (including 53 teeth, some measuring 4.5 inches). Over 50 percent of its bones are showcased in a specially designed $500,000 exhibit. Donated by the Elizabeth Streb Peroutka Foundation, the allosaur offers testimony to the truth of a worldwide catastrophic Flood over 4,300 years ago during Noah’s time. Appropriately, the striking allosaur is placed in the museum’s large Flood Geology room. At the same time, growing opposition to the Ark project by secularist groups made for international headlines. 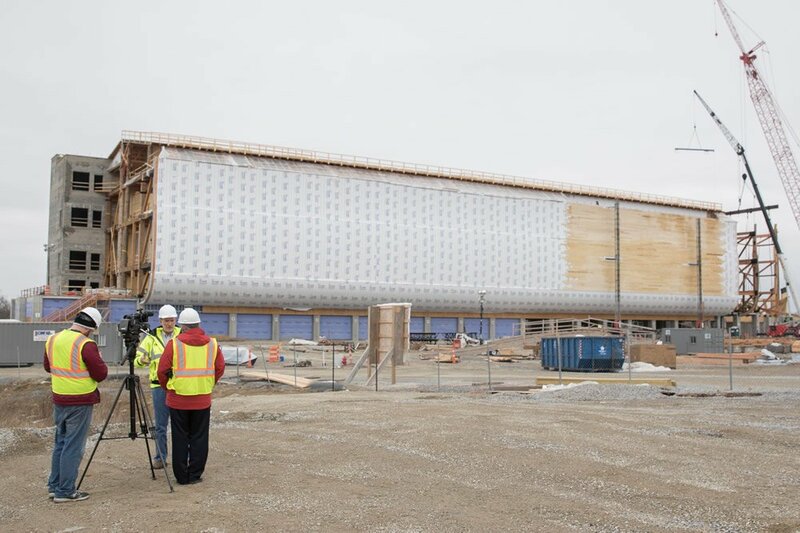 AiG spent considerable time at the end of the year debunking widely reported myths about the Ark Encounter, including “Kentucky is using its state funds to help build the Ark,” “the law requires a religious organization to open its hiring to non-adherents,” “the Creation Museum had declined in attendance this past year” (and thus presumably the future Ark will meet the same fate), and so on. While these claims were totally false, they continued to be circulated by some reporters and bloggers. The background to the false charges is that Kentucky had granted preliminary approval in 2014 for AiG to receive a rebate of some of the new state sales taxes the Ark would generate after it opened in 2016 if attendance was high and tourism dollars flow into the state. Secularist organizations exerted tremendous pressure on state officials to rescind the approval. These anti-Christian groups objected to AiG’s statutory right to limit its hiring to people of the Christian faith and to the content of the messages that would be presented at the Bible-themed park. Even though the sales tax rebate is made available by the state to all qualifying tourist attractions seeking to build in the state, Kentucky officials, including Governor Steve Beshear, reversed course and rejected AiG’s application on December 10. Kentucky officials argued that AiG must open Ark hiring to non-Christians and may not share the gospel at the theme park attraction. After another year of excellent attendance at the museum (with some days seeing record attendance), much of the attention on AiG in early 2015 was still focused on the future Ark Encounter and its struggle with Kentucky officials over lingering religious freedom issues. In an effort to counter yet another example of hostility towards religion in America, AiG filed a federal lawsuit on February 5 against Kentucky state officials (including Governor Beshear) for denying a sales tax incentive for the Ark. In the suit, AiG pointed out that the state rejected AiG’s application solely because of the religious identity and message of the Ark project. The lawsuit explained how this action by Kentucky officials violated federal and state laws and amounted to unlawful viewpoint discrimination. You can read the actual lawsuit at AnswersForFreedom.org. At that link, you can also watch a video of Ken Ham and attorney Mike Johnson of Freedom Guard discussing the lawsuit, with Johnson explaining the well-established legal principles supporting AiG’s case and why these principles are so important to defend for all Christian ministries. When such an unconstitutional state action goes unchallenged, it sets a dangerous precedent for all other religious and minority groups when they are treated as second-class citizens. Oral arguments were presented before a federal judge in early July. In June, the first large beams (called “bents”) were placed on the Ark’s large concrete foundation. For the next several months, Amish men, using their woodworking knowledge, joined the regular Troyer construction crew in adding these massive wooden beams. The goal was to finish most of the shell of the huge ship before the cold winter hits in January. At that point, Ark designers would spend the first half of 2016 installing the exhibits that have been under construction at a design studio and be ready for a summer 2016 opening. 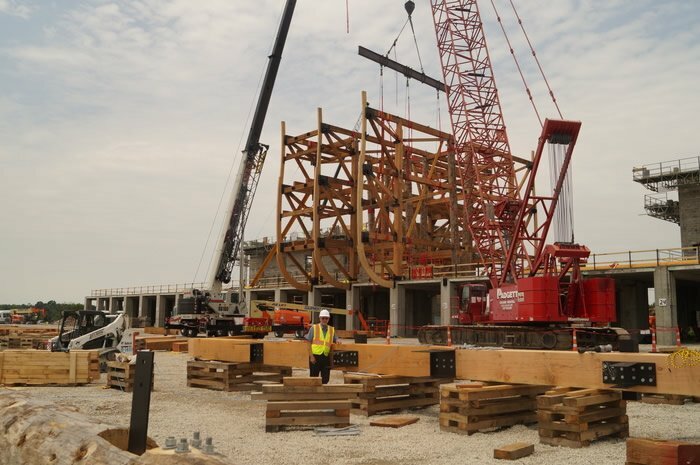 For a part of the summer, dozens of Amish woodworkers joined Troyer Construction in putting up many of the huge wooden beams called “bents” seen above, each weighing about twelve and a half tons. In September, the Creation Museum’s new planetarium show Aliens: Fact or Fiction? premiered. This high-tech production (answering the question, Is there intelligent life elsewhere in the universe?) was overseen by AiG astronomer Dr. Danny Faulkner. In eight years, the Stargazer’s Planetarium had welcomed well over one million visitors. On November 12, in front of over 30 media representatives gathered on the first deck of the Ark, Ken Ham announced the Ark Encounter’s opening date: July 7, 2016. Ham also declared that more than $80 million had been raised through bonds, donations ($24 million), and memberships for the theme park’s first phase (minimum of $91 million needed). Ham added that because of the initial interest in visiting the Ark, the Ark Encounter would have a “40 days and 40 nights” opening to handle the expected crowds—open in the morning/afternoon to visitors, and then re-open for an evening time period for another wave of guests to enjoy the Ark experience. On January 25, a federal court granted AiG and its Ark Encounter a major victory for religious liberty in America. A federal judge issued a preliminary injunction against the state of Kentucky for unlawfully blocking AiG’s participation in a rebate incentive for the Ark (see above for more background). The federal court found that the state's “exclusion of AiG from participating in the program for the reasons stated—i.e., on the basis of AiG’s religious beliefs, purpose, mission, message, or conduct is a violation of AiG’s rights under the First Amendment to the federal Constitution.” The judge ordered the state to move forward in processing AiG’s application for the available tax rebate incentives that would become effective after the Ark was operational. Most important, the decision upheld AiG’s right to religious preferences in hiring, declaring that AiG may “utilize any Title VII exception for which it qualifies concerning the hiring of its personnel” as a religious organization. Because the decision came in a federal court, a precedent may have been set that other ministries can use if they feel pressure from a government entity to hire non-Christians. Read AiG’s news release and the 71-page ruling. Kentucky’s new governor, Matt Bevin, decided not to appeal the court’s decision and expressed his support for AiG receiving the sales tax rebate. With those hurdles cleared, the application moved forward, and the state’s tourism development board unanimously voted on April 25 to give AiG the rebate incentive. A few days before the court’s major ruling, tickets for the Ark’s first forty days and nights had gone on sale for a summer opening. At the same time, the shell of the Ark was close to completion for a grand opening on July 7, and exhibits were being installed inside. As the Ark Encounter made news due to the religious freedom lawsuit in federal court against Kentucky and as dozens of reporters continued to visit the Ark's construction site, Ken Ham was given the honor of speaking about the Ark project and religious liberty at the closing session of the National Religious Broadcasters international convention in Nashville on February 26. The media’s extraordinary coverage included broadcasts on well-watched evening news programs like the NBC Nightly News with Lester Holt. Publicity for the Ark only increased when, on July 8, Bill Nye “the Science Guy” toured the Ark with Ken Ham, and their spirited 2014 debate resumed as they walked through the Ark, with Nye’s film crew in tow. The Ark Encounter remained on the nation’s cultural radar in July when the atheist group Freedom from Religion Foundation made news after threatening public schools with possible legal action if they sent students on a field trip to the Ark. A portion of the crowd that attended the private July 5 ribbon cutting. 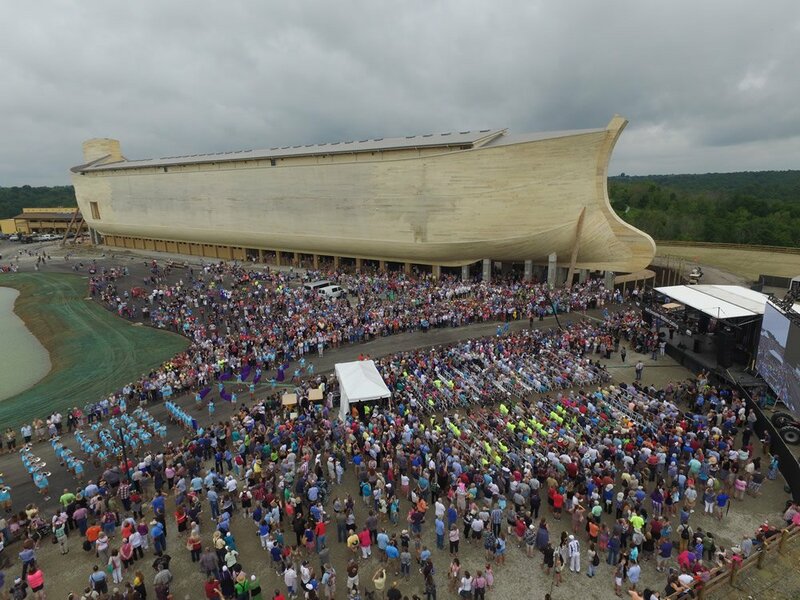 By the end of September and less than three months after its opening, the Ark had already surpassed the attendance figure estimated by a State of Kentucky study to take one year to achieve: 325,000 if the attraction had creationist content (which it does). AiG’s own research, through America’s Research Group, estimated that over a million people would visit the Ark in year one. Moreover, ARG predicted that because the Ark opened in July, and missed several weeks of the vacation season, year two may see higher attendance. Motor coach bookings were growing in the fall, and on some days, summer-like numbers of 6,000 or more visitors were touring the Ark. From July 7 through the fall of 2016, over 500,000 guests had toured the Ark. Meanwhile, as 2016 was ending, attendance at the Creation Museum was about double from the year before. 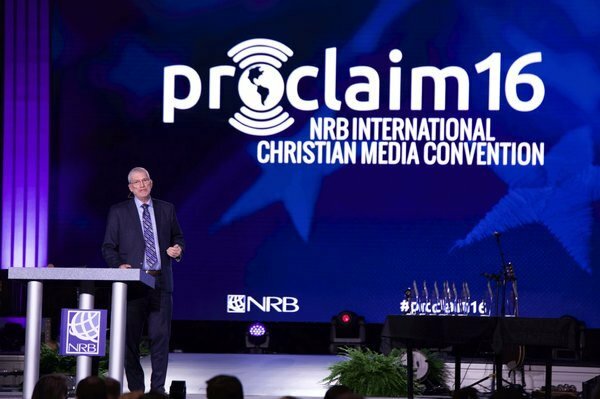 In March, AiG was given the prestigious Billy Graham Award for Excellence in Christian Communications by the 1,200-member National Religious Broadcasters (NRB). This annual award is given to a ministry that "effectively and creatively uses multiple electronic media technologies in fulfillment of its mission." 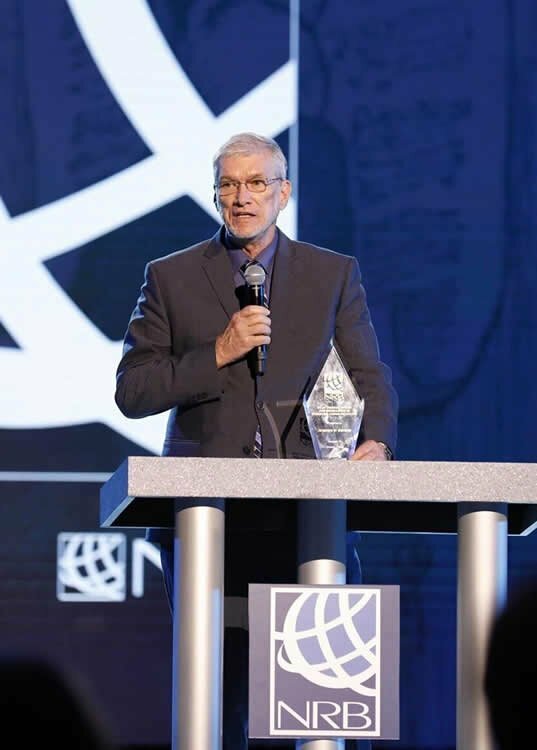 In congratulating AiG and Ken Ham who picked up the award, NRB President/CEO Dr. Jerry Johnson said, “Like Billy Graham, Answers in Genesis has exemplified a commitment to excellence, creativity, and biblical fidelity. In doing so, the ministry has been effective in faithfully directing people to Jesus and to the Scriptures, even in the face of opposition.” We praise God for this national recognition of AiG’s committed and talented staff. As spring started, motor-coach tour bookings for both the Ark Encounter and Creation Museum were extremely high, and hotels in the region were often fully booked. In early May, AiG President Ken Ham picked up his fifth honorary doctorate. Bryan College in Dayton, Tennessee (the town which hosted the famous 1925 Scopes “Monkey Trial”) conferred a Doctor of Science degree to recognize Ken's “courageous proclamation of the truths of Scripture.” On Memorial Day weekend, the Creation Museum, seeing record attendance (about than double the year before), opened the new 3 Cs exhibit (Christ, Cross, Consummation). This large display offers even more museum teaching about the life of Christ, his death on the cross and resurrection, and his future coming again. In late spring and early summer, the Ark Encounter opened two outdoor villages featuring food vendors, retail shops, and an education park to better orient Ark guests to the Genesis account of the Flood and Ark before they enter the massive Ark structure. In June, a lawsuit closely monitored by religious-freedom watchers across the country ended. In the end, AiG geologist Dr. Andrew Snelling finally received the research permits he had requested in 2013 from the Grand Canyon National Park so that he could continue his field work inside the canyon. Because of Dr. Snelling’s religious and creationist beliefs (as evidence was later uncovered by Dr. Snelling’s pro bono attorneys at Alliance Defending Freedom), his permit applications had been denied. Presented with the clear-cut, documented evidence of an anti-Christian bias in the permits’ denial, the Grand Canyon National Park and the Department of Interior changed course and issued the research permit, as well as a raft-launch permit, for additional on-site work in the canyon. With equal access to the canyon now granted him, as any qualified evolutionary geologist would receive, Dr. Snelling and his attorneys voluntarily dismissed Snelling v. United States Department of Interior in federal court, thus thwarting an attempted to infringe on the religious liberty of a Christian who is a creationist and a qualified scientist. The results of some of Dr. Snelling’s research at the Grand Canyon were scheduled to be released sometime in 2018. 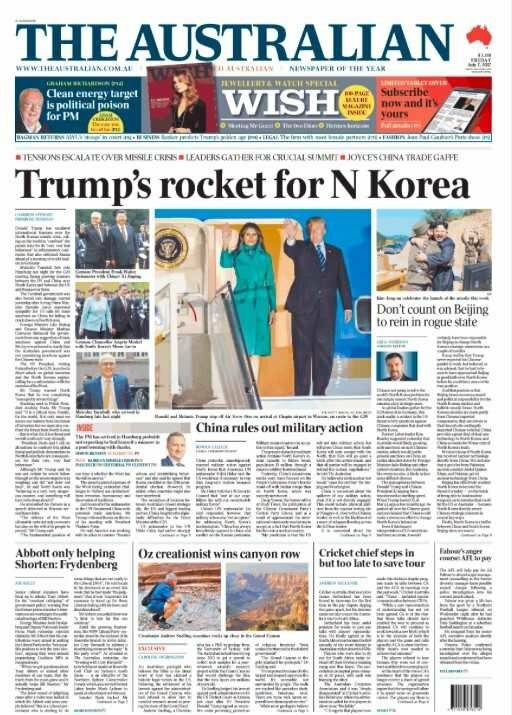 Dr. Snelling’s legal battle to continue his research in the Grand Canyon became international news, including the front page of Australia’s national newspaper (in the article titled “Oz Creationist Wins Canyon Row”). On July 7, the Ark Encounter celebrated its first anniversary. During the entire month, the Ark continued to welcome thousands of guests each day from across America and overseas, with the impressive visitor numbers only increasing. Even though the Ark did not open until the middle of the summer tourist season of July 2016, its first “non-normal” year still welcomed over one million visitors. AiG predicts that second-year attendance will be over 1 million, based on several factors: hundreds of motor coaches are now booked to come (very few came in 2016 because the Ark was a brand-new, untested attraction, and it requires several months for bus tours to be organized), other group bookings are increasing, people now have ample time to plan their summer vacations to the Ark, the launch of an ambitious national marketing campaign, and other encouraging trends. In the summer, the Ark Encounter had days when 40 buses could be seen in its parking lot, with another 30 at the Creation Museum—nearly all of them from outside AiG’s tristate area of Kentucky, Ohio, and Indiana. The museum saw daily average attendance more than double on most days compared to 2016. Using an equation from a regional tourism bureau, the Creation Museum alone has added a minimum of $500 million to the local economy since 2007. The Ark Encounter, which draws more than twice as many visitors as the museum, had a first-year economic impact of around $200 million. The only “downside” in the summer of 2017 was that countless people informed AiG they couldn’t find hotel rooms on some dates and gave up coming. Thankfully, many hotel developers were looking to build in the area so that, in the future, there could be days of more than 8,000 people (the high day so far) at the Ark. Tens of thousands of people visited the Creation Museum and Ark Encounter in December, enjoying special Christmas outreaches called “ChristmasTown at the Museum” and “ChristmasTime at the Ark.” The Ark showcased a stunning new laser projector show called “Encounter the Wonder” using 15 projectors, with the Ark serving as a 510-foot-long screen. Visitors were treated to an animated spectacle of history from Creation to Christ, with the gospel powerfully presented. The premiere of the spectacular “Encounter the Wonder” video-projection show at the Ark, with 15 laser projectors and a 510-foot-long screen. 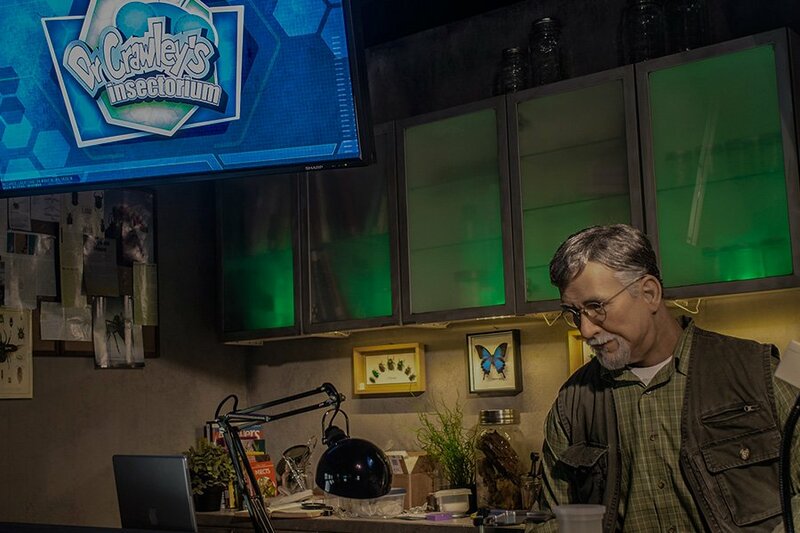 After 10 years of operation and coming off its best year of attendance, the Creation Museum was due for some major changes. “Operation Upgrade” is a $2.9 million project for 2018 and into 2019 to keep the museum’s technologies at the cutting edge (such as creating a 4D theater) and adding important new exhibits. Already, corridors inside the museum, which were seeing bottlenecks on the busiest days, were being widened at the end of 2017. Also of great significance in 2017, AiG opened international offices in Mexico (to serve all of Latin America), Australia, and Canada. We praise God for these new opportunities of international ministry outreach. In 2017, the high day for number of visitors to AnswersInGenesis.org was 140,000 people. This figure did not include visitors to the other AiG websites, such as ArkEncounter.com. Last year, over five million people visited ArkEncounter.com. The high day in 2017 for visitors to our two attractions, the Ark and Creation Museum, was 12,000. Replacing Darwin by AiG’s Dr. Nathaniel Jeanson offers a direct frontal attack on the arguments Charles Darwin used to promote evolution. AiG continues to be a prolific producer of apologetics/evangelistic resources. A groundbreaking book Replacing Darwin: The New Origin of Species by AiG’s Dr. Nathaniel Jeanson (PhD, biology, Harvard) was released in the latter part of the year. This work may be the first major book to carefully research and offer a direct frontal attack on the very essence of the arguments Darwin used to promote evolution—arguments that have become popularized in Western culture, including inside much of the church. March was a news-making month for AiG. 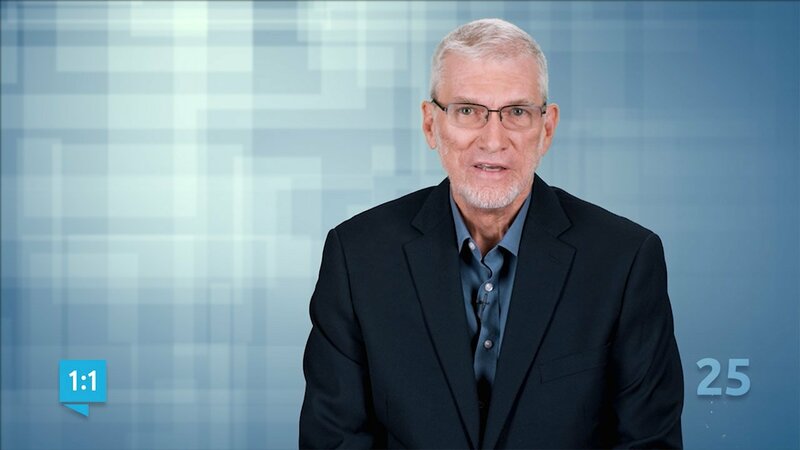 On March 5, an Oklahoma speaking engagement involving Ken Ham drew attention from the national media—but it almost didn’t happen. The University of Central Oklahoma (UCO) had contracted Ham to talk about the ideas of Darwin in the school’s Constitution Hall. But strong objections from members of a campus LGBTQ group pushed the student body president to cancel the talk, despite a speaking invitation that came from the student government. Apparently, the activists did not notice the irony of their actions as they attempted to deny Ham’s constitutional right to speak in Constitution Hall. Under pressure from concerned state legislators, several area residents, and alumni about suppressing Ham’s right to free speech, the UCO president re-invited Ham to give his talk, “Genesis, Science, and the Culture” on the Edmond campus as scheduled. Joining Ham at the presentation was Dr. Georgia Purdom from the AiG faculty (PhD, molecular genetics), who spoke on “Genetics and the Bible.” The event went off without any disruptions, with thoughtful questions posed by the audience during the follow-on session. Several TV stations, newspapers, and prominent news websites covered the Ham/Purdom talks. 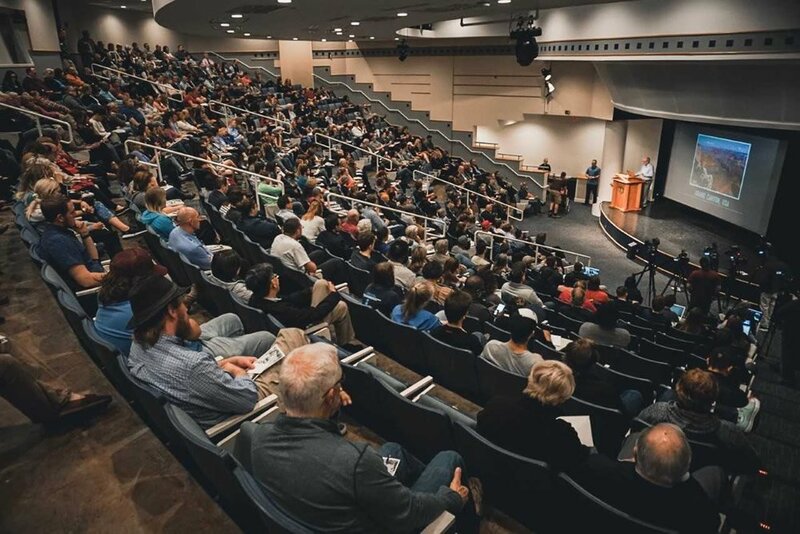 Ken Ham speaking at the University of Central Oklahoma on March 5, a lecture which almost did not occur. Also in March, the Ark Encounter and the Creation Museum restructured ticket pricing to encourage more families to visit. The goal was to help families, churches, schools, and other organizations bring as many children and youth as possible to the Ark and museum. All children and youth (17 and under) now enjoy lower ticket prices (ages 4 and under are free). The theme parks also did away with the weekly unlimited pass; instead, they now offer a relatively inexpensive annual pass. In July, the Ark Encounter celebrated the end of its second year of operation, with over one million annual guests once again attending this world-renowned Christian themed attraction. In time for the summer rush, visitors were treated to many new additions, like the educational Monument Walk on their way to the Ark entrance, the new Rainbow Gardens outside the entrance to the growing Ararat Ridge Zoo, and the completely renovated Emzara’s Buffet restaurant, to name a few. 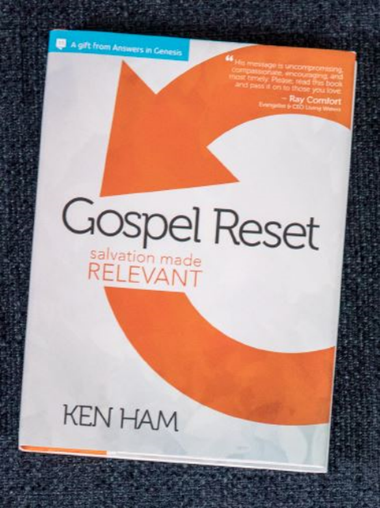 In September, Ken Ham’s revolutionary new book Gospel Reset was sent as a mass mailing to all churches in America (266,000 congregations). The package included complimentary tickets for church leaders to visit the three leading world-class Christian themed attractions in the US: the Ark Encounter, Creation Museum, and the striking new Museum of the Bible in Washington, D.C. Tens of thousands of additional copies were also shipped to churches in several other countries. The huge mailing of the books to churches was yet another major AiG effort to impact and help revitalize the church in western nations. Gospel Reset shows churches and all Christians how they can be more effective in evangelizing a secularized culture. It also reveals how the gospel message of Jesus is rooted in Genesis, such as the prophetic verse of Genesis 3:15. In 2019, a 2,500-seat multi-purpose auditorium called the Answers Center (on the other side of the lake from the Ark) will open and play host to lectures, live animal shows, concerts, and other programs. Over the next few years, a Walled City, which will represent the time before Noah’s flood, and a depiction of the Tower of Babel, which occurred after the flood, will be built. This year marks AiG’s 25 years of significant global outreach. In addition to having welcomed several millions visitors to its two attractions, AiG’s several other outreaches have been directly impacting many more millions of people each year. To God be the glory as AiG celebrates 25 years. 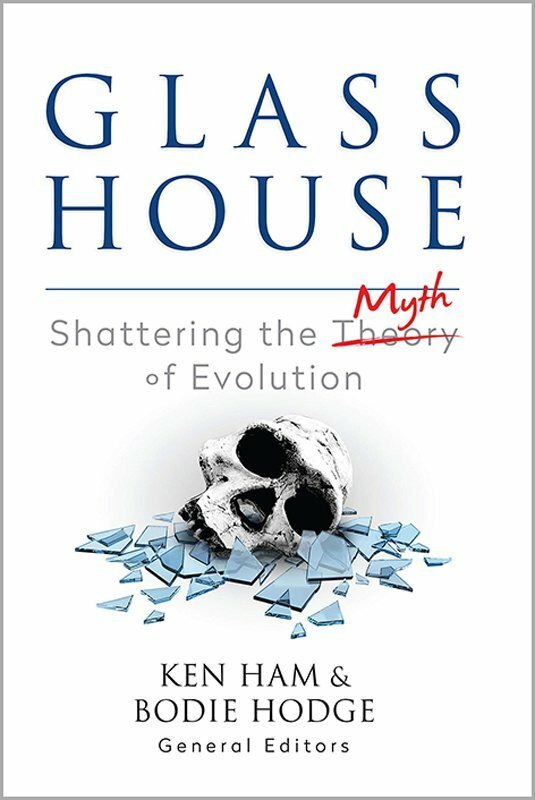 In February, AiG released the eye-opening book, Glass House: Shattering the Myth of Evolution, co-edited by Ken Ham and Bodie Hodge. The chapters were written by AiG experts who masterfully exposed the fallacies and weaknesses that evolutionists really don't want people to know … and then proceed to defend Genesis creation. Glass House reveals, at a layperson level, the flaws in the common evolutionary arguments presented today. This cutting-edge book dismantles evolution argument-by-argument and shares evolution’s devastating impact on society. The Answers Center, which features a stunning new state-of-the-art 2,500-seat auditorium, opened in April at the Ark Encounter. The multi-purpose center greatly enhanced the Ark Encounter’s ability to educate and entertain its guests, by hosting speakers, movies, concerts, conferences, banquets, and more. The centerpiece of the auditorium is a bright 70-foot-long LED screen, capable of projecting 3D backdrops and movies. 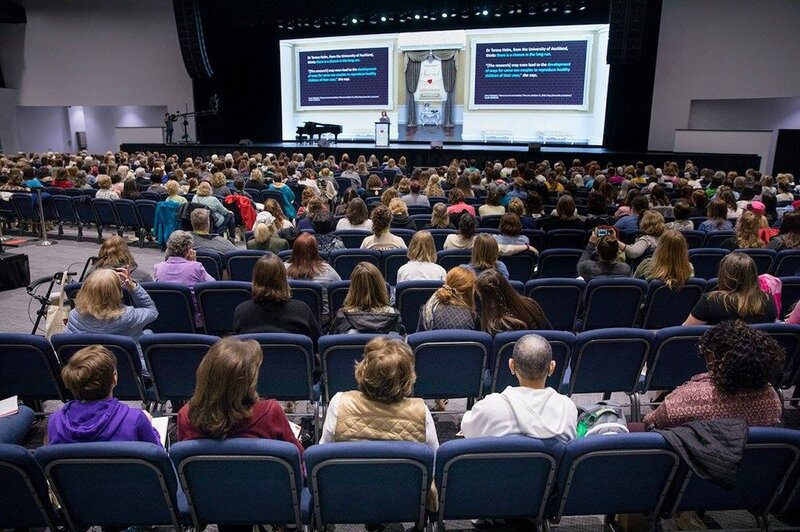 In April, two national conferences were held in the new Center: a women’s seminar and an Easter conference over many days that answered the most-asked questions posed by atheists. AiG, with over 1,200 full-time and part-time/seasonal staff members, is the world’s largest Christian apologetics organization. In addition, and as was mentioned earlier, the AiG “sister” ministry based in Leicester, England, continues to have an impact in Europe—it is often profiled in the major media (e.g., BBC–TV/Radio) and conducts teaching meetings throughout Western and Eastern Europe. Meanwhile, AiG’s offices in Australia, Mexico, Peru, and Canada were seeing fruitful ministry. As AiG–US’s board members look to the future, they are considering many new or expanded Bible-proclaiming outreaches, including in the much-needed areas of curriculum development and international programs, and constructing additional phases at the Ark Encounter on the 800-acre property surrounding the Ark. Throughout 2019 and 2020, enhancements inside the Ark and next to the ship will continue, and fundraising will begin in earnest for the themed attraction’s next phases: an ancient-looking walled city and a replica of the Tower of Babel. The US Board, recognizing that AiG was largely dependent on the name recognition of its CEO in the first years of the ministry to help AiG get kick-started, is pleased today to see that the Ark Encounter, Creation Museum, popular website, expanding curriculum department, several new speakers, and so on, are making AiG less dependent on Ken Ham to grow the ministry (thus leaving Ken with more time to work closely with the board in strategizing how AiG’s vision can be taken into new areas, as God gives the opportunities). In the summer of 2018, Joe Boone was appointed as AiG president, reporting to CEO Ken Ham. As AiG looks back at over 25 years of wonderful, fruitful ministry, and anticipates God’s blessings on the various initiatives for 2020 including the expansion of the Ark Encounter, we can say, “To God be the glory, great things He has done!” Watch Ken Ham’s short anniversary video below. The museum was listed as a $25 million project in 2006, but because of anticipated crowd challenges, the museum staff decided to expand the lobby by 7,000 square feet, double the size of the café, and add 84 more parking spots, making the construction cost over $27 million for the first construction phase (i.e., when the museum opened in May 2007; since that time, several new exhibits and enhancements have been added). Other non-construction costs (e.g. hiring museum staff, advertising, media relations, etc.) were also incurred. There are other sources of revenue for the entire Ark Encounter, including memberships (which are not classified as donations).